How does one write about Paris? Do they talk about the beauty of the city or the vibrant people or the delicious food or falling in love? If they are a travel writer, then most likely yes. It’s impossible to capture the essence of a place in a few sweeping observations, so we invoke images we are familiar with, even if we’ve never been. This is the exact problem I had when arriving. I had black and white photos of Paris in my mind, romanticized close-ups from some French film in college, where a couple in trench coats embrace in front of Notre Dame and others smoke skinny cigarettes in some café. What film and photos failed to capture is the experience. I took over 1,000 pictures in four days, and I couldn’t find it. That single picture that would somehow convey the gestalt of Paris: the feeling of walking around for an hour and not making it out the gardens of the Louvre, the way every building for miles around adheres to a certain aesthetic, the awe of standing beneath the massive Notre Dame Cathedral and understanding why it would take 200 years to complete. So what to expect? Well get the whole quaint little city image out of your head and get ready for a bursting metropolis. 1. The entire city is the attraction. Yes there is the Arc de Triomphe and the Eiffel Tower, but really Paris itself is a beautiful city. They have very strict zoning laws for buildings, which becomes immediately apparent as city block after city block conforms to the same color palettes and facade styles. There are no brand new sky scrapers crammed in between historic buildings. The entire city feels like it was plucked from the 1800′s and preserved perfectly. 2. You will need to take the Metro (subway). As much as Paris is a city for walking, you simply can’t get everywhere by foot. The Metro is exhaustively well connected, which can make reading the metro maps a little daunting, but once you orient yourself it’s relatively easy to zip around the city. Want to look Parisian? Read a book as you ride. 3. There will be tourists everywhere you go. The German guy next to you had the same idea, “I’ll go to Paris!” You’re just as likely to hear someone speaking English, Russian, German, Spanish, or Arabic as you are to hear French. Even when I was 30 minutes north of the city, I still ran into tourists. 4. Soda will cost as much as your Sandwich. I’m not sure how the math on this works out, but for 3.50 Euros I can get a ham sandwich on an entire baguette. For 3.50 more I can get a mildly chilled Coke. If you’re traveling on a budget (like I was), then opt for a coffee (une cafe about 2 euros) instead. 5. However long you stay, isn’t long enough. I already have regrets about the things I didn’t see. I had enough time to hit a few large attractions, wander the city and get to know the place a little. If I had realized how small a dent I would be making in Paris, I might have planned my itnerary more carefully. Then again, some of my accidential finds where well worth it– like the statue of Moliere I ran into while slightly lost. 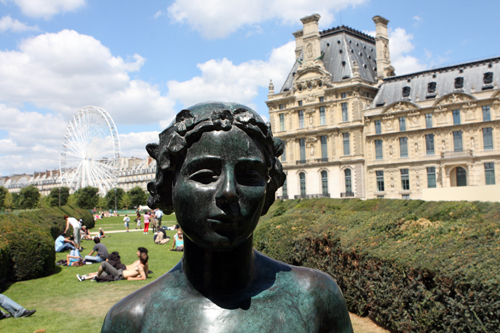 Do you have any travel tips for a first-time (or hundredth-time) visitor to Paris?